Learn about the need for uniform code across each page of a website. Create a layout for the website design, which can be applied to each page in the site. Open Brackets – it should remember your folder from the last lesson. Using the Internet, find some images of your favourite actor or actress. Save your images to the images folder you have created. You can see here that some names are VERY long and complex. Right-click and select rename to choose something more appropriate (e.g. freeman1.jpg then freeman2.jpg etc). Make sure you save and test this by going to the File menu and choosing Live Preview. We have absolutely no indication of how this material should be displayed. HTML helps us by giving us text and images etc. It doesn’t let us format the information though. In the last lesson we used style sheet information in a style tag, however this isn’t the best way of doing it. As the video suggested, for this, we can use CSS in a stylesheet. In Brackets, click File and create a new file. Save it as stylesheet.css – this MUST be saved in the same folder as the index page. Now we can use the stylesheet! All pages that use this sheet will now have a green body. How about changing fonts? Normally you’re limited to the font installed on the computer used to view the website. 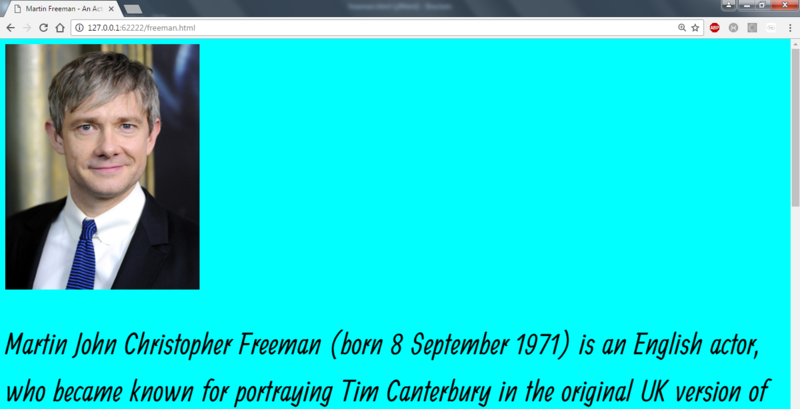 We can thankfully add some more interesting fonts to our website using Google Fonts. Now refresh your page in Chrome, and… hey presto!! It would be fair to say that our image is a little big. Why not just over-ride the <img> tag in our stylesheet to make sure images default to a sensible size? 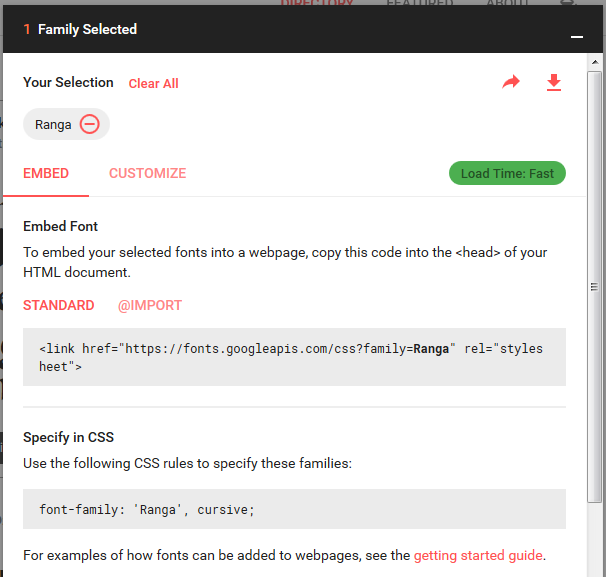 So now we can change fonts and colours by over-riding html tags. Now we need to go one step further and look at the layout of our pages. We can make “containers” and specify their position. 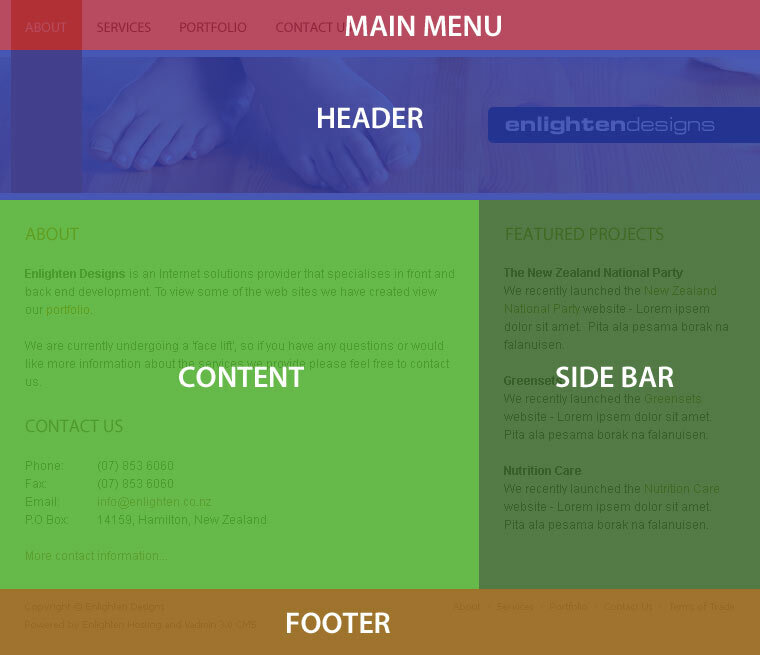 This is is really useful as we can very quickly create a neat professional looking page layout. You can see this fairly standard web page can be split into different sections. In fact, using CSS, all pages on this whole website will probably have the same layout. We can achieve this very easily with our css stylesheet. So you can see we’re creating named boxes which “float” – so we can specify their position, width, height, background colour and much more. Try to finish off the layout from the image above. You’ll need to add to both your stylesheet and your index page. You’ll need a “sidebar” container, and also a footer. Take a screenshot of both the .css code and the finished page for your books. Draw your own design for your fansite. Make sure you have a sensible layout of boxes and columns. Now, edit and adapt your index page to match your own layout, and screenshot both your page and your code.